Franklin L. Pope, AIEE President, 1886 - 1887, one of America’s first practicing electrical engineers. In addition to his inventions and patents, which greatly contributed to the field of electrical engineering, he authored several books in the genres of literature, history, and genealogy. Pope was president of the AIEE from 1886 to 1887. Franklin Leonard Pope was one of America’s first practicing electrical engineers, and made many significant developments to telegraph engineering. His inventions, patents and professional involvement were all extremely influential to the electrical engineering profession; Pope was a charter member of the AIEE along with such notable members as Thomas Edison, Nikola Tesla and Elihu Thomson, and served as the Institute’s second president during the 1886-1887 term. Pope was born in Great Barrington, Massachusetts, on 2 December 1840 to Ebenezer Pope, Jr. and Electra (Wainwright) Leonard. His lineage can be traced back to Thomas Pope, one of the first Pilgrims who had arrived at Plymouth in 1632. Shortly after graduating from the academy in Amherst, Mass., Pope started his professional life at the age of seventeen. His first job was as a telegraph operator in Great Barrington in 1857, which he held until 1859, when he relocated to New York City to work in the drafting department of Scientific American. Rejoining the electrical engineering field in 1862, he was made assistant engineer of the American Telegraph Company in New York. When the company’s telegraph lines were damaged during the draft riots of 1863, Pope personally repaired the lines with his own hands. 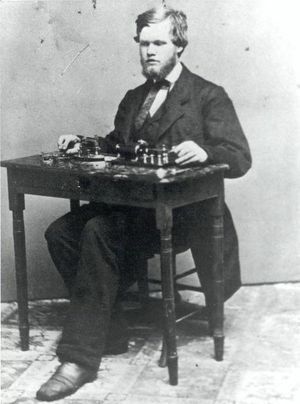 After the National Telegraphic Union was formed in 1863, Pope was appointed as the Secretary of the New York district, and using the pseudonym of “Elektron,” he was the first contributor to its publication, The Telegrapher. In 1864, the Western Union Russian Extension Company had appointed Pope to assistant engineer and chief of the geological department. In this position, Pope, under the guidance of Edward Conway, had surveyed parts of British Columbia, including the first explorations of the land lying between the Skeena, Stickeen and Yukon rivers for the preliminary stages of laying the Collins Overland Telegraph Line. This proposed line would have stretched from San Francisco to Moscow, traversing territory through British Columbia, Alaska, going over the Bering Strait and into Siberia. The project was aborted shortly after the 1866 landing of the transatlantic cable in Heart’s Content, Newfoundland, effectively rendering Pope’s Bering Strait route obsolete. Following the abandonment of that project, Pope returned to New York and continued to write articles for The Telegrapher, and served as its editor from 1867-1868. After developing a system which tracked and printed the prices of gold and stocks, Pope partnered with Thomas Edison in 1869, forming the company Pope, Edison & Company Electrical Engineers, and invented a one-wire telegraph in 1870. This telegraph is now known as a stock ticker, and was widely used in large cities for exchange quotations. Pope’s partnership with Edison did not last long; the firm dissolved shortly after it was formed in 1870. In the years following, Pope was awarded several patents for his work in railroad semaphore lock signal systems, the most important of which was his 1872 invention for the rail circuit for automatic control of the electric-block signal system, which was widely used by the major United States railways. In addition to his inventions and patents, Pope also published a great deal of literature dealing with not only subjects related to electrical engineering, but also pertaining to history and genealogy. 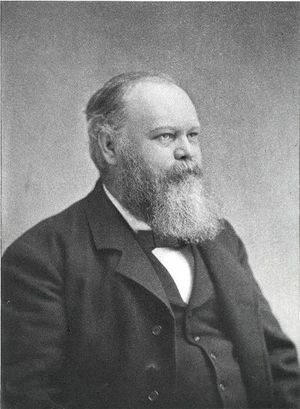 Among his publications are the following titles: Modern Practice of the American Telegraph (1869), Modern Practice of the Electrical Telegraph (1871), The Life and Works of Joseph Henry (1879), The Western Boundary of Massachusetts: a study of Indian and Colonial Life (1886), Evolution of the Electric Incandescent Lamp (1889), and Genealogy of Thomas Pope (1608-1683) and Some of his Descendants (1888). Pope served as editor for the magazine Electrical Engineer (later called The Electrician and Electrical Engineer, which was later shortened to The Electrical Engineer), and he edited the electrical department of The Engineering Magazine. Pope also worked as a patent attorney for Western Union Telegraph Company, and was retained as an expert in many important patent suits. Active in many professional societies, Pope was a charter member of the American Institute of Electrical Engineers (AIEE; the predecessor of IEEE) and served as its second president from 1886 – 1887. He was a member of the British society Institute of Electrical Engineers (IEE) since 1872, serving as one of its first vice-presidents, and served as vice-president of the American Electrical Society of Chicago in 1878. Pope’s younger brother, Ralph, was also very involved with the AIEE, serving as its secretary from 1885 – 1912. On 8 August 1873, Pope married Sarah Amelia Dickenson, the daughter of Captain M. Fayette and Hannah (Williams) Dickenson, with whom he had three children, Hannah Dickinson, Amy Margarette and Franklin Leonard Wainwright. The last major project in Pope’s life was the reconstruction of the Great Barrington electrical plant, an alternating current lighting plant previously operated by Westinghouse. After moving back to Great Barrington in 1894, he reconstructed an old brick house build in and named it “The Old Pope House.” Its cellar served as a station for Pope to watch the operations of the plant. Instead of using the customary procedure of routing the plant’s primary wires to a pole outside of the house, Pope brought the wires into a converter in the cellar. On the evening of 13 October 1895, the lights in the Old Pope House were not functioning correctly, and Pope went into the cellar to investigate problems with apparatus. Moments later, his family was startled by the sound of Pope’s lamp exploding. They discovered Franklin lying dead by his apparatus, killed instantly by 3000 volts. In a great twist of irony, the force that he had studied his entire life, made an outstanding career out of and became prominent and influential in, had brought upon his early demise at the age of 54. Papers of Franklin L. Pope - Archival collection housed by IEEE, containing numerous documents pertaining to many aspects of his varied and interesting career. Included in the archives are reports dealing with land surveys of Alaska and Russia, correspondence with Elisha Gray regarding Gray’s patent battle with Alexander Graham Bell, and correspondence regarding the patent and invention of his railroad signaling apparatuses.